Are you ready for Spring? I sure am! Say hello to my Spring Collection: These polishes are now available in my Etsy store. Swatches are by the talented Emily from Very Emily. Thanks so much girl! If you’re interested you can read her review with more photo’s on her blog. Which one(s) is/are your fave? Get your here 😉 Don’t forget to use code 10OFF at check out to get 10% discount! Baby’s Bottom is a sheer pale blue base bursting with different size matte hex glitter in pastel blue, pink and lavender. It dries to a semi-matte finish. It’s part of the Scoops ‘nd Sprinkles Collection which will be available for purchase at the shop this Monday! Check out more (daylight) pics and the other five polishes of this collection at the shop page! Today I have something super exciting to share with you guys! Serena from the awesome beauty blog BeautyLab has swatched and reviewed some of my creations. Her pictures are just perfect! The post will give you a good impression of three of my creations. Although it’s written in Dutch, I think everyone needs to take a look! 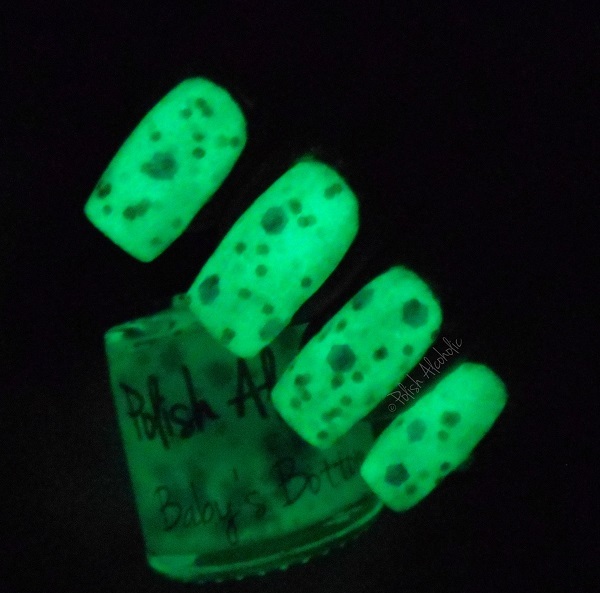 The most exciting part -to me- is the Instavideo that she made of ‘Lumos Solem‘, a glow in the dark polish packed with tons of holographic awesomeness 😀 I think everyone needs to watch that video! Pssshhtt… there’s a discount code to get 10% off your order (>€20,00, valid until October 31). Check it out! And yeah, of course I welcome custom orders! I feel that your nails say a lot about you. So, if you’re looking for that particular polish but can’t find it anywhere? Don’t hesitate to contact me. I’d be happy to create something unique especially for you. With love!